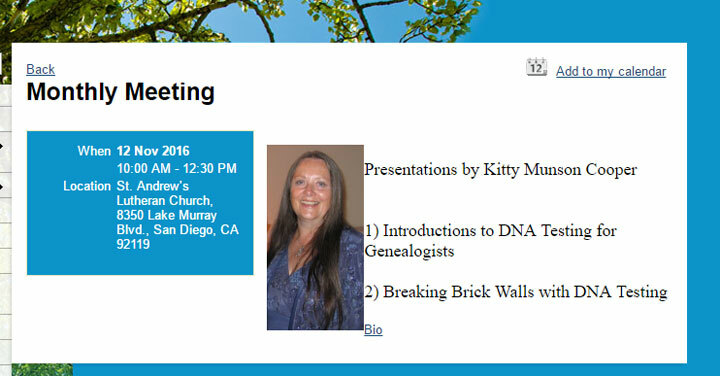 The Genealogy Society of San Diego is having me give two talks this coming Saturday, one about DNA basics for genealogists and the other about how I broke some brick walls with DNA testing in my own family. Talking about using DNA for genealogy is something I love to do. While I have lots of posts and pages here, there is nothing like being able to discuss it in person. The questions I get teach me what is difficult to grasp about this shiny new tool in our genealogy kit so that I can better help others. After the talk, I will put the links to my slides at the end of this article, but they have very few words so they are less useful if you were not there. All my presentation slides are at slides.com/kittycooper and the handouts that go with them are in my downloads area here. I can only imagine the pain of not knowing your family’s medical history or origins or why your mother gave you up for adoption. DNA testing has reunited many adoptees with their birth families. Some get lucky and find their biological parents within days of their test results. Others work on it for years before succeeding. There are some wonderful reunion stories at DNAadoption.com – Trish’s story moved me to tears, as did many of the others. That web site has a tried and true methodology and classes for using DNA in these searches. Also if you have not read his autobiographical story of his search, I highly recommend it; click on image at the left to get that book from Amazon. It reads like a good mystery novel. Times have changed now and for many it is no longer an embarrassment to have a child out of wedlock. These days an adoption can be open, which solves the medical and ancestry issues for the adoptee (see http://www.adoptionhelp.org/qa/what-open-adoption ). But back in the 1950s and 1960s, being unmarried and pregnant was a huge social stigma, so many of those women still want to hide that fact today.